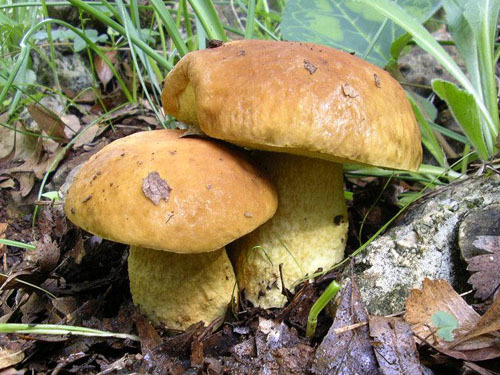 Leccinum lepidum (P. Bouchet) Quadr. 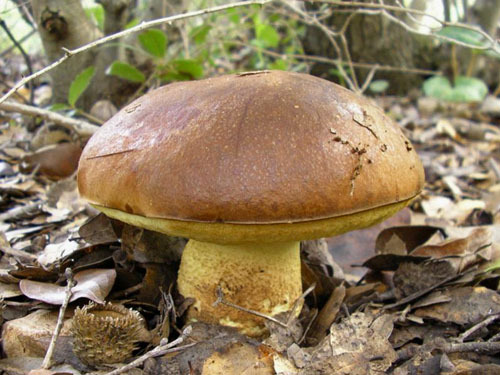 Cap up to 12 cm, at first hemispherical, then convex, yellowish brown, ochraceous, orange brown, brown, dark brown to almost blackish, dry, but distinctly viscid in wet weather. 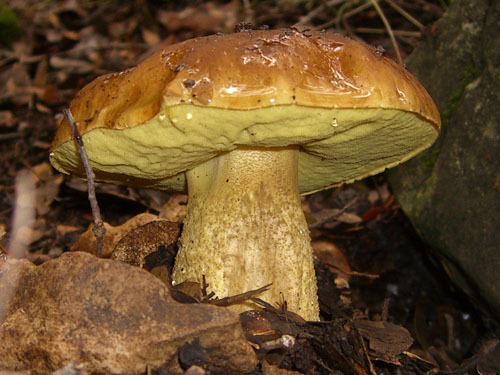 Stipe usually stout, ovoid, cylindrical or slightly club-shaped, pale yellow to yellow, often discolouring with age to cream or whitish, covered with yellow to rusty or brown granules. Flesh pale yellow to whitish, changing to pinkish or reddish, and then to violaceous or greyish, when exposed to air. Tubes pale yellow to yellow. 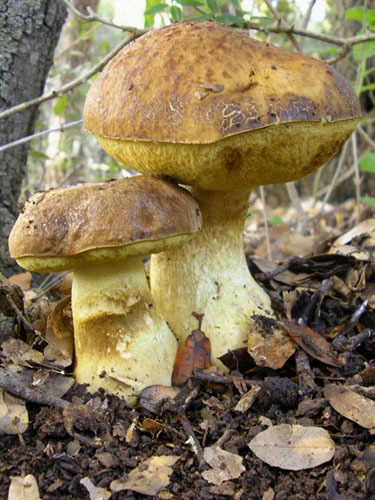 Pores concolorous with the tubes, sometimes tinged rusty, darkening to somewhat ochraceous when bruised. Smell not distinctive. Taste not distinctive. Spores 13.5–21 × 5–6 μm. Pileipellis trichodermium of septate hyphae of finely incrusted cylindrical cells. Habitat. Broadleaf forests, mycorrhizal with evergreen oaks (Quercus coccifera, Q. ilex, Q. suber, Q. faginea). Distribution. Not yet fully understood, but apparently a southern species, seen so far only in the Mediterranean area – France, Italy, Sardinia, Spain. Outside Europe it is spotted also in Israel, judging from findings of amateur mycologists. Similarity. 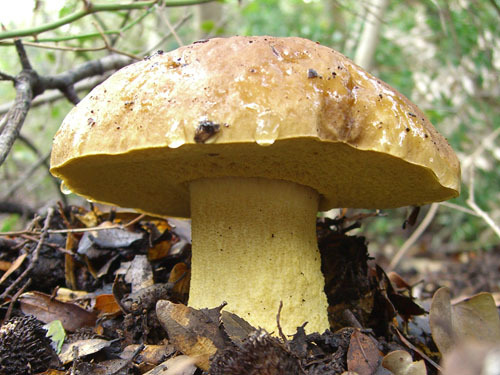 Similar to Leccinum crocipodium, but the cap cuticle of the later contains spherical cells that are absent in L. lepidum. 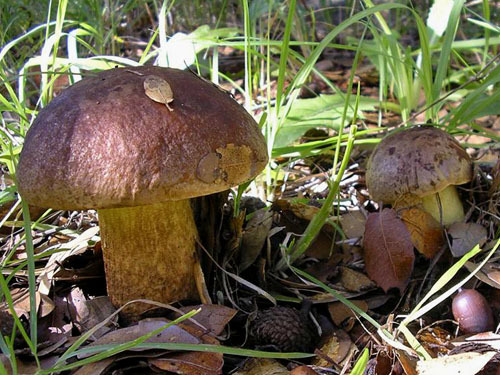 Leccinum corsicum is also very similar but it also has spherical cells in the cap cuticle and grows in different habitat, mycorrhizal with rockroses (Cistus).